AutoMist is is now available in select markets. Traditional hood and flue cleaners send in a cleaning crew on a quarterly or semi-annual basis. They shut down your kitchen to scrape or wash away grease with harsh chemicals, often leaving behind a mess or damaged equipment. Our AutoMist system eliminates the need for these costly, messy cleanups by automating the entire process for a worry-free experience. AutoMist cleans your hoods, flues, and fans on a regular basis. By installing sprayers along the hood and up the flue to the exhaust fan, every nook and cranny are thoroughly cleaned. The delivery system that contains detergent automatically controls when your cleaning is initiated, meaning you never have to think about it. The best part? You don’t have to shut your restaurant down when it’s time to clean. 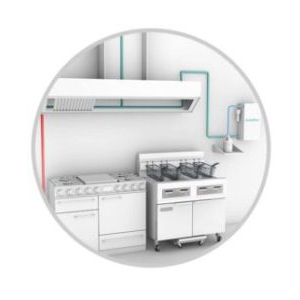 The AutoMist system minimizes fire risk in your restaurant every day by keeping the hood, flue, and fan area clean. With daily cleanings, grease is no longer accumulating over time. This keeps your restaurant–and everyone in it–safe. Are you a Fire Marshal? Click here to learn more about AutoMist approved systems. AutoMist cleans your hoods, flues, and fans on a regular basis. By installing sprayers along the hood and up the flue to the exhaust fan, every nook and cranny are thoroughly cleaned. The delivery system that contains detergent automatically controls when your cleaning is initiated.